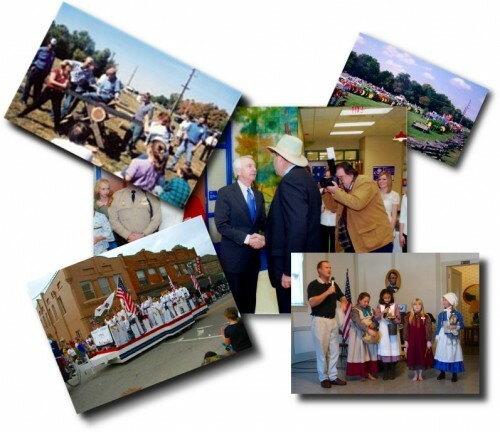 Events & Activities | Lincoln Days Celebration, Inc. In addition to our annual Lincoln Luncheon, we sponsor numerous activities and events during our festival in the fall. From craft booths and food, to Abe and Mary Todd Look-a-Like contests, there is always something of interest. You may view our complete schedule here, or you can view the rules, download registration forms, and learn a little more about individual events or activities by clicking the link on the right. Clockwise from top left: Pioneer Games, Tractor Show, Little Sara Look-A-Like, and Parade. Center: Treasurer and Board Member Major Rob Barnhill, USA (Ret.) meets Kentucky Governor Steve Beshear at before the Lincoln Luncheon celebrating Abe’s 199th birthday on February 12, 2008.